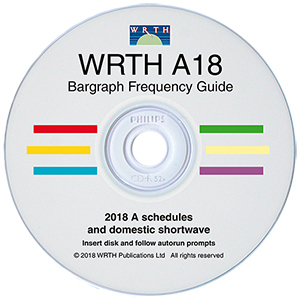 Prices for the latest editions of WRTH and the Bargraph CD, along with past editions of WRTH are shown in our shop. The price for CDs includes postage to all destinations. Postage costs for WRTH are based on the destination, with different prices for delivery to the UK, Europe, and other Worldwide destinations. Please see the postage calculator on our web shop for postal rates. The prices for CDs and downloads include VAT at 20% for customers ordering from the United Kingdom. Purchase online with either a Visa or Mastercard credit or debit card using the secure payment link, or via PayPal. You can also e-mail your order to us at sales@wrth.com, sending a copy of the order form from the site or downloading and sending this order form. If you would rather simply send an email, then please include your card billing address, and your delivery address if that is different. Please also send your credit or debit card type (Visa or Mastercard / debit or credit), your card number, expiry date and three-digit security code from the back of the card, and the name of the issuing bank. We recommend that you include this information in a pdf file and attach the pdf to your email. Orders received by 13.00 UTC will be dispatched on the same working day. For an even faster service choose the courier option on the book order page and your copy will be delivered to your door by UPS. Faster delivery is not available for CDs, but CDs ordered with a copy of WRTH will be sent by courier if that option is selected for the book. Please note that for book deliveries to South & Central America, Mexico, the Indian subcontinent, the Middle East and China we recommend using our courier service. If you do not select courier delivery we cannot replace your book if it is lost in the mail. N.B. We are closed at weekends, for the holiday period 22 December – 5 January, and on other UK holidays. Visa or Mastercard credit or debit card (using a printed copy of the order form). Please state if your card is debit or credit. • Visa or Mastercard credit or debit card (including the information given above under Fastest Method). Please state if your card is debit or credit. All cheques and money orders should be made payable to WRTH Publications Ltd.
You can also send cash but this is not recommended and is sent entirely at the purchaser’s risk. Please note that the payment methods stated above are the only methods that we are currently able to accept. Please note that in the two to three weeks after publication, in December each year, delivery times may be longer because of the large number of orders we have to process and the mail backlog caused by the holiday season.